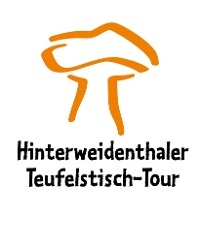 A leisurely hike for both young and not so young with adventurous attractions - this is the Teufelstisch tour in Hinterweidenthal. 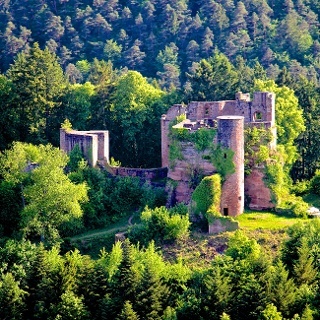 As the name suggests, the main role of this ten-kilometre hike is the legendary Teufelstisch, the landmark of the region of Hauenstein. 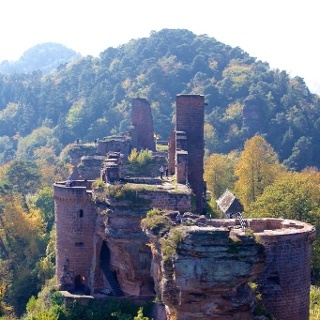 This tour is particularly suitable for families because of the new theme park “Erlebnispark Teufelstisch”, which is aesthetically embedded in the rocky landscape. Above the park is the entrance to the premium trail. Along a narrow path, it leads parallel to the Salzbach towards Salzwoog. Along the way you pass the Schwammbonnquelle. This spring lies mystically concealed in a small pond in a gloomy forest. For those of you who want to enjoy this unusual atmosphere, they can either enjoy an extensive snack at the picnic area or relax on a wooden bench above the pond and listen to the quiet burbling of the spring water. 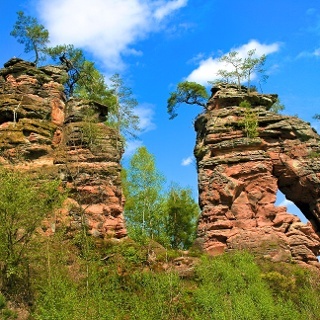 This tour is particularly suitable for families because of the new theme park “Erlebnispark Teufelstisch”, which is aesthetically embedded in the rocky landscape. Above the park is the entrance to the premium trail. Along a narrow path, it leads parallel to the Salzbach towards Salzwoog. Along the way you pass the Schwammbonnquelle. This spring lies mystically concealed in a small pond in a gloomy forest. For those of you who want to enjoy this unusual atmosphere, they can either enjoy an extensive snack at the picnic area or relax on a wooden bench above the pond and listen to the quiet burbling of the spring water. Strengthened and ready to continue the hike, we soon reach the village of Salzwoog where the route leads around the elevation of the “Hoher Kopf” and back again into the forest. A great view of the surrounding hillsides is offered by a charmingly- situated resting place with the appropriate name: "Schöne Aussicht". Now it is not far to the "devilish" sights, although the trail is anything but evil since the rays of the sun shine through the dense treetops making you feel closer to heaven than hell. 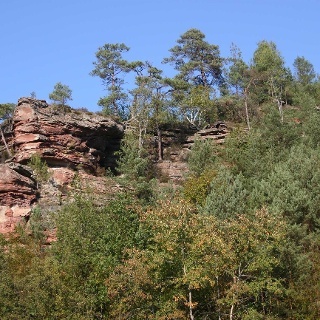 After 30 minutes, you get to the bizarrely-shaped rock formation "Teufelsschmiede" and a few metres further on to the "Teufelsküche" - a multi-layered formation of red sandstone. 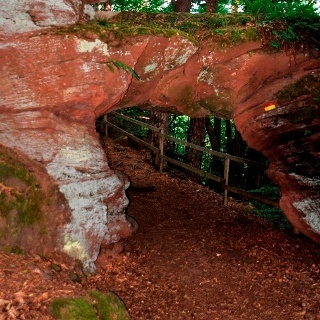 The main attraction of this trail comes towards the end: the natural monument "Teufelstisch” (Devil's Table). 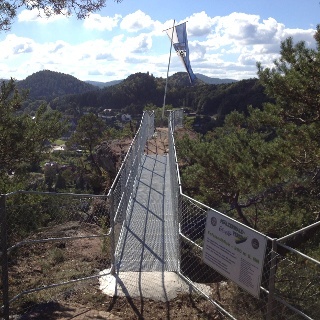 With a height of 14 metres and its unusual shape, it is the only geotope in the Palatinate. On the surrounding rocks, which have been rounded off smoothly by wind and weather, you can sit down and take a breather whilst enjoying this unique rocky outcrop. According to legend, the devil had set up two rocks as a table and then had a feast. After he had eaten to his fill, he left the table standing and went on his way. Fortunately, you have to confess with a wink, because the region of Hauenstein certainly would not like to do without this “devilish monument. Don’t forget to take snacks with you in your rucksacks. The length of this tour makes it suitable for families. Refreshments can be found in the immediate vicinity of the Erlebnispark Teufelstisch or in the local gastronomy of Hinterweidenthal. A trip to the amusement park Erlebnispark Teufelstisch is also worthwhile! Take the train to railway station Hinterweidenthal. B 10 (Landau/Pirmasens), exit Hinterweidenthal. Parking at the Erlebnispark Hinterweidenthal. Ja, die Pfalz hat sicher schönere Wanderwege zu bieten, und nicht jeder Wirtschaftsweg muss gleich ein als „Premium-Wanderweg“ ausgewiesen werden, aber diese Tour mit einem einzigen Stern zu „verreißen“, wie das einige Kritiker hier tun, ist doch ganz schön übertrieben. Auch die Kritik an der Beschilderung konnte ich im Januar 2018 nicht nachvollziehen. Der Teufelstisch ist in der Tat eine beeindruckende und sehenswerte Gesteinsformation, auch wenn vor Ort die viel befahrene Bundesstraße nicht zu überhören ist. Doch darauf allein sollte man die Tour in der Bewertung nicht reduzieren. 3,5 Sterne wären m.E. fair. Premiumwege, Premiumwege, Premiumwege.... Wieso muss eigentlich jeder Meter Forstweg zum Premiumweg werden??? Eine an sich schöne Tour mit -einem- Highlight und ein paar kleinen Passagen auf Pfaden. Die restlichen *Autobahnen* bräuchte man m. E. hier nicht, schon gar nicht als Premiumweg. Manch ein "alter" Wanderweg hätte ohne Übermarkierung und Premiumwahn sicher mehr zu bieten. Aber nun gut. Tour ist ok ...ist gut Beschildert...Breiter Weg, etwas Pfad...Steigungen...viel los ..